Definition It is the amount of energy consumed per unit of time. It is a measure of a force whose effect can rotate the object. Generation Generator and Battery Induces when the force apply on an object. Formula Ratio of work and time. Product of force and distance. Applications Domestic appliances, industries, grid, etc. Car wheel, car steering, for opening bottle cap, motor shaft etc. The power is the measure of the amount of work done, or in other words, power is defined as the amount of energy utilise per unit of time. It is measured in Joules/ seconds, and their SI unit is watt. The power is mainly classified into two types, i.e., the electrical power and the mechanical power. The electrical power is the rate at which work is done by an electrical circuit. The electrical power is mainly classified into three types, i.e., the apparent power, the real power, and the reactive power. The apparent power is the product of the RMS value of the voltage and the current. It is also called idle power. The active power is the real power which is dissipated in the circuit, and it is represented by P. The active power is consumed only in resistance. The reactive power is the power consumed only in the reactance of the circuit. The symbol Q represents it. It is measured in VAR. The mechanical power is the amount of energy used in doing work. It is measured in joule/second. 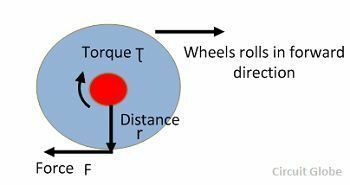 The torque is the measure of the circular force whose effect can rotate the object. In other words, it is the product of the force and the distance. The torque is also called the twisting power. The SI unit of torque is newton-meter and newton-meter is equivalent to joule. Examples of torque – For tightening or opening the cap of the bottle, we have applied force through the hand. The more force we apply, the more torque is increased. Also for tightening or loosing the nut through spanner and for twisting the steering of the car torque is applied. The torque is expressed by the formula explained below. The power is the amount of energy consumed per unit of time, whereas the torque is the measure of energy whose effect can rotate the object. The unit of power is a joule per second, whereas the unit of torque is equivalent to the joule. The SI unit of power is the watt, whereas the SI unit of torque is Newton-meter. The electrical power is caused by the generator or through the battery and the mechanical power is developed by doing work. The torque is induced when the force is applied on an object or body. The power is defined as the ratio of the energy consumed with respect to time, whereas the torque is the product of the force and distance. The power is represented by the letter P whereas the torque is represented by the Greek alphabet Τ (tau) . The power is a scalar quantity (i.e. Directionless) whereas the torque is a vector quantity. The torque twisted the object in a direction opposite to which the force is applied to it. The power is mainly classified into two types, i.e., the mechanical power and the electrical power. There is no specific type of torque. The electrical power is measured through the energy meter or multimeter whereas the torque is measured through torque sensor or torque meter. In vehicles, the power is the capability of an engine to run the vehicle at its maximum speed. The power is equivalent to the speed of the vehicles. But the pulling capability of the vehicle is determined by the torque. Also, we can say the torque is the load carrying capacity of the vehicles.